When researchers at the University of California, San Diego wanted to an experimental Alzheimer’s drug last year, they sought help from an unlikely group: people with Down syndrome. “I had a CAT scan on my head, and I was in a special machine. It’s called an MRI,” says Justin McCowan, 39, whose parents drove him 125 miles from Santa Monica so he could participate in the study. McCowan also took brain function tests and spent hours with a needle in his arm so researchers could monitor levels of certain chemicals in his blood. 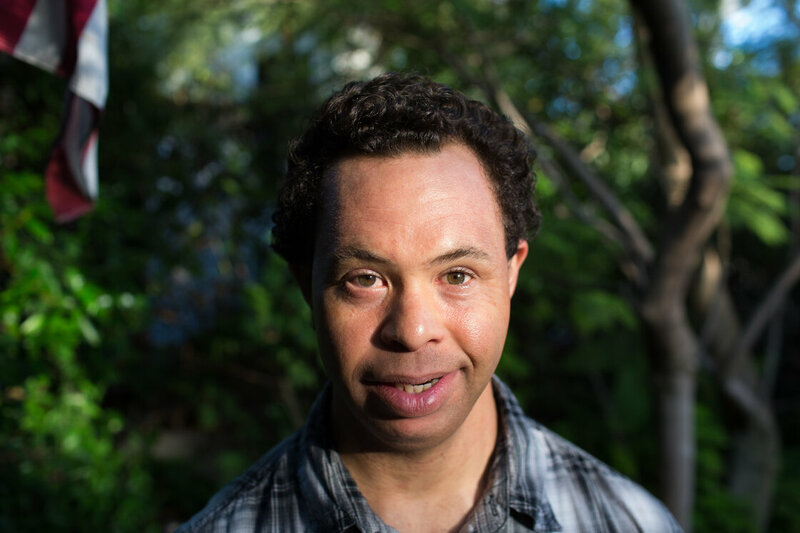 Alzheimer’s researchers are increasingly interested in people like McCowan because “people with Down syndrome represent the world’s largest population of individuals predisposed to getting Alzheimer’s disease,” says , director of the Memory Disorders Clinic at UCSD. Down syndrome is a genetic disorder that’s best known for causing intellectual disability. But it also causes Alzheimer’s. “By the age of 40, 100 percent of all individuals with Down syndrome have the pathology of Alzheimer’s in their brain,” Rafii says. Down syndrome is caused by the presence of an extra copy of chromosome 21. And one of the genes on chromosome 21 happens to control the production of , the substance that forms the sticky plaques associated with Alzheimer’s. Because their bodies produce extra amyloid, most people with Down syndrome develop problems with thinking and memory by the time they reach 60. Rafii has chronicled the decline of one of his patients, a woman named Irma, by collecting her signatures from medical forms over the years. People like Irma used to be rare because the medical problems associated with Down syndrome meant they rarely lived long enough to get dementia. Today, though, better medical treatments mean people with the disorder often live into their 60s. And that has created a huge opportunity for Alzheimer’s research, says , chairman of the neuroscience department at UCSD. “This is the one group in the world that you could argue would benefit most by the institution of early therapy,” he says. Early therapy means starting people on drug treatment years before the symptoms of Alzheimer’s appear. The approach has been hard to test because, in the general population, there’s no good way to know who is going to develop Alzheimer’s. But for people with Down syndrome, it’s a near certainty. 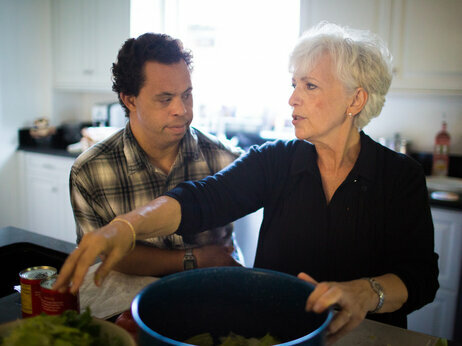 Justin and his mother, Annamarie McCowan, make a salad together. That’s a long-term goal. But already, people with Down syndrome are making a difference in Alzheimer’s research. Early work with Down patients helped confirm the importance of amyloid. More recently, people with the disorder helped test an eye exam that may offer a simple way to screen for Alzheimer’s. And then there’s the study that Justin McCowan signed up for. It involves a drug from Transition Therapeutics that, in mice, can prevent the brain changes associated with Alzheimer’s. Scientists hope the drug can do the same thing in people, including those with Down syndrome. McCowan says he volunteered for the study because he wants to help other people, especially a friend of his named Maria, who also has Down syndrome. “I feel very sad about Maria because she doesn’t remember anything,” McCowan says. His parents, Don and Annamarie McCowan, say their son’s memory is still sharp. They hope that what scientists are learning from people like Justin will keep it that way. Two Texas teens with Down syndrome had the night of their lives last Friday, when the best friends were named honorary team captains for their high school football team. Local news outlet WFAA reports Blake Pyron and Austin Waters, incoming seniors at Sanger High School in Denton County, Texas, have long supported the school football team, often fetching water for players. Last year, the two led the players out of the tunnel before every game. As a thank-you for their continued support, both became members of the team at an assembly last Friday, complete with their own team jerseys. And to say they were excited would be an understatement. Might Blake and Austin eventually take a page from the playbook and go for a touchdown? It happened last year at a high school in Wisconsin, when Noah VanVooren, a senior with Down syndrome, was invited onto the football field for the first time — and ran the ball into the end zone for a touchdown. A discovery in a cave on the Indonesian island of Flores, reported 10 years ago, moved one scientist to hail it as “the most important find in human evolution for 100 years.” The fragmentary bones, but only one full skull, of several individuals led the discoverers to conclude that these were remains of a previously unknown extinct species of humans. The Australian and Indonesian scientists named the species Homo floresiensis. Some took to calling these unusually little people, who had apparently lived on the island as recently as 15,000 years ago, the hobbits. It was mystifying that people with brains apparently no larger than a chimpanzee’s, one-third that of modern Homo sapiens, would have been capable of making the stone tools found in the cave around them. From almost the beginning, a few skeptics raised warning flags. 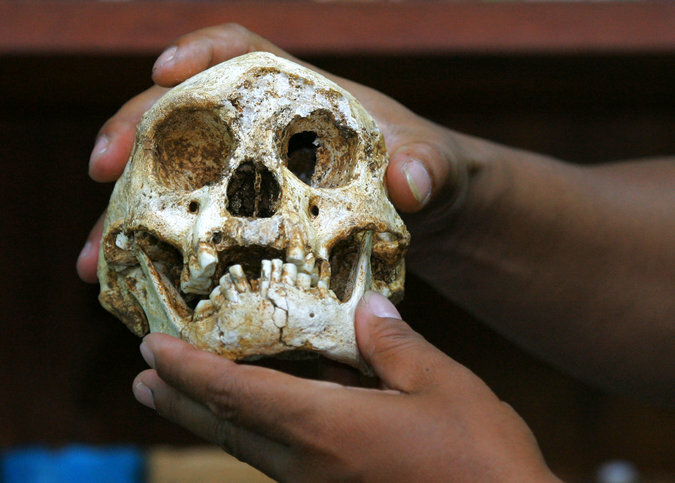 Was the one skull sufficient evidence of a distinct human species? These people were small, yes, but how could the Flores skull be proved normal and not that of a modern human with any of a number of growth disorders that shrink the head and brain? The skeptics have now revived the debate with two papers published on Monday in The Proceedings of the National Academy of Sciences. One article points out what are said to be flaws in the original research reports. The second one describes evidence suggesting the individual was born with Down syndrome. Among the flaws, the critics say, were underestimates of the stature and the brain size of the most complete skeleton, designated as LB1, from Liang Bua Cave. In their view, LB1’s stature was a little more than four feet tall, not 3.5 feet as in the original estimate. New measurements of the possible brain size were likewise large. The lead author of the second paper on the Down syndrome hypothesis was Dr. Henneberg, a professor of anatomy and pathology, with Dr. Eckhardt, a professor of developmental genetics and evolution, as a co-author. Based on a re-examination of the available evidence, the researchers said the revised dimensions of the LB1 cranium and femur fell in the range predicted for an individual with Down syndrome from that region of Indonesia. The larger size estimate also matches that of some people today on Flores and other Pacific islands. The scientists also pointed to the skull’s asymmetry, a left-right mismatch of facial features, as characteristic of people with Down syndrome, one of the most common developmental disorders in humans. They noted that it occurred in more than one human birth per 1,000. Other scientists who tended to accept the new-species interpretation have so far rejected what they call the “sick hobbit hypothesis.” Dean Falk, an anthropologist at Florida State University who specializes in brain evolution, used CT scans of the Flores cranium that she said showed no sign of growth disorders. Stephen Green, 49, is one of just a handful of parish councillors with a learning disability in the United Kingdom. Elected onto Nuthall Parish Council in Nottinghamshire last year, Green has Down’s syndrome and his dad, Grenville Green, assists him to be an active member of the community. Parish councillors help organise events, fundraise for local charities and fix problems such as the classic pothole in the road. Some may be surprised to hear that a man with Down’s syndrome can partake in community activities like this but is this because they fundamentally can’t do it, or because there isn’t enough support and access for equal participation? Councillor Green says his greatest success has been to save the popular monthly Men’s Breakfasts in his parish by volunteering to gain a food hygiene certificate and so allow the early morning club to continue. Shortly after Jean Vanier, Philippe Seux, and Rappahël Simi moved in to a small home in Trosly-Breuil, France, Jean asked his friend Jacqueline d’Halluin help him name the house. Only later did Jean realize the symbolism of the word, which means the ark in French. The story of Noah’s ark – a boat of salvation for God’s people – appears in Christian, Jewish, Muslim, and Hindu scripture as well as they mythology of other early cultures, and aptly symbolizes a place where people can find safety from life’s raging storms. Today, there are L’Arche 146 communities in 39 countries where people with and without intellectual disabilities share their lives together. Born in 1964 out of the Roman Catholic tradition, communities today focus their spirituality around Christian, Jewish, Muslim, Hindu, and inter-faith traditions. While each has its own unique characteristics, they share common core values of dignity, relationship, spirituality, sharing life in community, and solidarity with one another. This year the International Federation is celebrating the fiftieth anniversary of the founding of that first small home by passing five wooden arks from community to community. Each ark can be opened to reveal three levels in which pictures, signatures, and inscriptions are being collected. L’Arche Greater Washington, D.C. hosted one of the traveling arks July 1-11. During its stay, the community re-enacted the story of Noah’s ark with founding core member Michael Schaff playing the leading role. Mamie’s Mile is a one mile walk in the Spring Valley neighborhood of town for anyone who wants to support the National Down Syndrome Society. 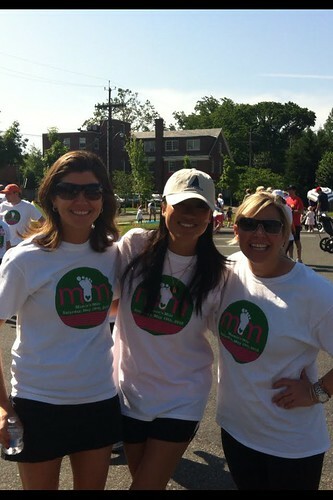 Mamie’s Mile was founded by husband and wife Teddy Eynon and Elizabeth Manresa who lost their daughter Mamie Grace, who had Down Syndrome, due to complications during heart surgery when she was just a baby. But life is about recognizing the worst and most devastating situations and turning them into good, as this couple courageously did. More than a year after the death of Ethan Saylor, a 26-year-old man with Down syndrome, his mother continues to fight for him and others like him. “I want to tell you firsthand that today’s hearing will save future lives,” Saylor said. A new blood test offers pregnant women a safe and much more accurate way to screen for Down syndrome. A study that evaluated the test in 1,914 pregnancies found that the test, which checks DNA, produces far fewer false alarms than the current screening techniques. Bianchi and others stressed that the results of the screening test would still need to be confirmed by follow-up diagnostic tests — either amniocentesis or chorionic villus sampling, which can cause miscarriages. But the new blood test would send fewer women for that risky testing. Doctors recommend that all pregnant women get screened for Down syndrome and other trisomies, which are conditions caused by too many chromosomes. 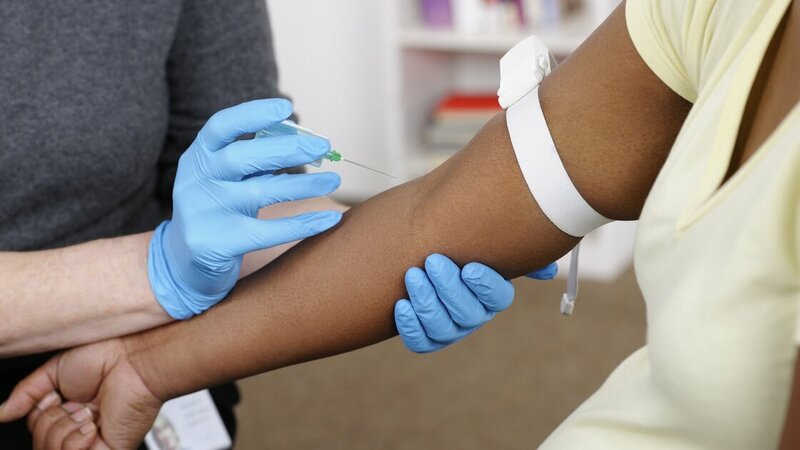 But the tests, which rely on measuring chemicals in the mother’s blood and doing an ultrasound of the back of the neck of the developing fetus, can raise flags when none are warranted in a small but significant number of cases.